Kevin Birmingham, a lecturer in history and literature, is the author of “The Most Dangerous Book: The Battle for James Joyce’s Ulysses.” Harvard's Houghton Library has nearly all the placards, or galley proofs, printed in 1921 in Dijon, France, from "Ulysses." And Joyce might have felt right at home during mealtime in the Birmingham household, where lively, unrestrained conversation was the norm. It was also ideal preparation for writing about a book that shocked and bewildered many of its readers, was banned in the United States for more than a decade, and spent years in court battles. 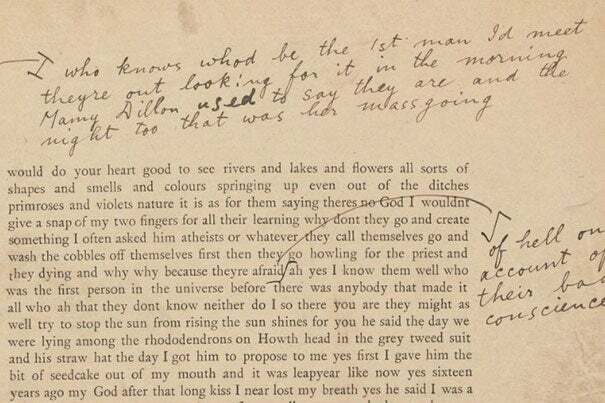 Joyce’s “Ulysses” opened the author’s mind to the world. Many, offended by his use of vulgarity and frank approach to sexuality, would have preferred it remained closed. To others, the long, circuitous novel that tracks Leopold Bloom around Dublin on June 16, 1904, was a work of genius. By now, of course, “Ulysses” is regarded as a masterpiece, a book that “made everything possible,” writes Birmingham. But that freedom came at a price. In his debut book, published in June by Penguin, Birmingham charts the efforts of Joyce and his admirers as they struggled to set “Ulysses” free. The placards, like this one pictured, contain Joyce’s detailed revisions, corrections, and additions. While Birmingham didn’t consult the holdings during his research, he did reference their facsimiles available in Harvard’s Widener Library. At Cornell he viewed the “dirty letters” between Joyce and his wife, Nora Barnacle, which inspired some of the most scandalous passages in “Ulysses.” What he found were pages surprisingly free of alterations. The discovery was a shock because Joyce was notorious for tinkering with his manuscripts, repeatedly frustrating his printer by drastically altering the galleys sent to him for corrections. Scrutinizing Joyce’s writing process is only one of Birmingham’s aims in “The Most Dangerous Book.” Much of the narrative follows the efforts of a group of fearless women, including Sylvia Beach, the owner of the Shakespeare and Company bookstore, and Margaret Anderson and Jane Heap, founders of The Little Review, who were instrumental in delivering the book to the public. Birmingham’s final chapters, which track the definitive U.S. court battle over “Ulysses,” benefitted greatly from a chance encounter. While researching his book, Birmingham bumped into a friend who knew the granddaughter of John Woolsey, the federal judge who heard the case and ruled in Joyce’s favor in 1933, paving the way for the novel to be legally imported. After a few phone calls, Birmingham connected with Woolsey’s grandson, a man “dedicated to his grandfather’s memory.” Soon he was watching home movies, reading family documents, reviewing a never-published New Yorker profile on the judge, and taking a private tour of Woolsey’s library. Friends and colleagues from Harvard helped Birmingham with his work in less concrete but equally important ways. At a regular Friday night happy hour with faculty from the history and literature department, he got feedback on ideas and shared the particular struggles of bringing a book to life. This evolution of appreciation is one reason Birmingham decided to include Virginia Woolf in his story. She and her husband politely declined to publish Joyce’s early chapters through their Hogarth Press. The book “fails, one might say, simply because of the comparative poverty of the writer’s mind,” she wrote after her first encounter with it. But “Ulysses” wouldn’t let Woolf go. Two years after she read the entire book, Woolf began transforming a short story she had been working on into a novel. “’Mrs. Dalloway,’” writes Birmingham, “delves into the consciousness of three characters during a single day in London. “Print is still very useful, volume by volume,’’ said Jeffrey Henderson, general editor of the Loeb Classical Library since 1999. But digital “gives people the opportunity to do something we can’t do with the print version.’’ The Loeb Classical Library Foundation joined with Harvard University Press to digitize all of the library’s 520-plus volumes.